Why is that car sold off so soon? He's had it for just a year and that car is hardly some bachelor toy piece, but firmly in "family car" territory. Maybe MEggles doesn't like the color. Is this the same car she was caught rummaging through? ^That would be the one. I feel bad for Richard Palmer for all the flak Murky's fans have been giving him since he spoke up. Honestly, I don't think some of these people have an idea of what racism means. Anything less than absolute fawning over Smirky is somehow interpreted as being racially charged, and it's awful to see. Not just to RP, but everywhere else too. *MODS- meant to put in random chat thread. Please move. Thanks. Citing a source, Nicholl says that the Prince is trying to shield Meghan from too much exposure to the media. ‘He worries there is too much hysteria around Meghan and he wants to row back a bit,’ the source said. Nicholl goes on to say how the couple has told friends to avoid speaking to the media, with Harry reportedly clamping down on his friendship group and telling Meghan to follow suit. ‘They both expect a code of silence. If you talk to the press you’re out,’ the source said. And now, according to Vanity Fair’s Katie Nicholl, Meghan and Prince Harry have issued their own rule. ‘Harry has certainly built an emotional fortress around himself and Meghan. They have both been extremely upset by Thomas Markle’s behavior and that of Meghan’s half sister, Samantha,’ she said. Please. You don’t pick a woman with all this baggage and the love of the attention from the press and them try to protect her from the press. This should be an exit for her to push off back to America and Harry taking his holiday in Africa. ^ I always enjoy reading Katie Nicholl Fan Fiction. Upps! I do mean her alternative facts on British royal lives. So, if we read between the lines may we reasonably come to the conclusion that PH may be overwhelmed or underwhelmed with the camera hoe and is trying to cut off her magic sugar supplier? So basically alienating friends for "privacy"? This tops Bill Medd, never thought someone could top that paranoidly-shrieking-"privacy!"-ninny-at-every-turn-and-sue-the-press-at-the-drop-of-a-hat. Haz is even worse than Bill for crying out loud (and as I learnt a while ago, Haz files more complains on the press than Bill!!). Also guess what one of the signs of an unhealthy relationship is? Yep, alienating friends and reducing or cutting off contact. ^^ PS Indeed. What did he expect? Marry in haste, repent at leisure Haz. You made your bed, now lie in it. You made your pick, live with it and stop whining, it is most unbecoming, esp in a grown man. Tom Hardy has opened up about his friendship with Prince Harry, who he described as a 'f*****g legend'. Speaking to Esquire magazine, the actor 40, said his bond with the Duke of Sussex was 'deeply private'. Hardy and Prince Harry, 33, have been friends for a number of years and were spotted mingling at the Audi Polo Challenge at Coworth Park Polo Club in Berkshire in 2016. The Dark Knight Rises star was even invited to Harry's wedding to Meghan Markle at Windsor Castle in May. Hardy was asked why he was invited to the wedding, which he attended with his wife Charlotte Riley. He wouldn't go into details about the friendship, simply saying it was 'deeply private'. However, he would say his royal friend was a 'f*****g legend' during the interview. He also opened up about receiving a CBE in the Queen's Honours List, which he called an 'honour'. Hardy revealed that his assistant almost rejected the honour after mistakenly assuming he wouldn't want one. Hardy and Prince Harry were spotted looking deep in conversation at the the Audi Polo Challenge two years ago. Tom ended up way better than Harry rearding wo he's with. The quote about Harry being a ledgend could be regarding his partying, but look where that's gotten him. He says the relationship is deeply private yet blabs to the media. My laugh of the day. Harry’s in Africa without MM and his wedding ring. I doubt if this is from last year because he wasn’t a duke during his last trip. The Duke of Sussex has returned to his beloved Botswana to catch up on the work of a rhino charity he supports. 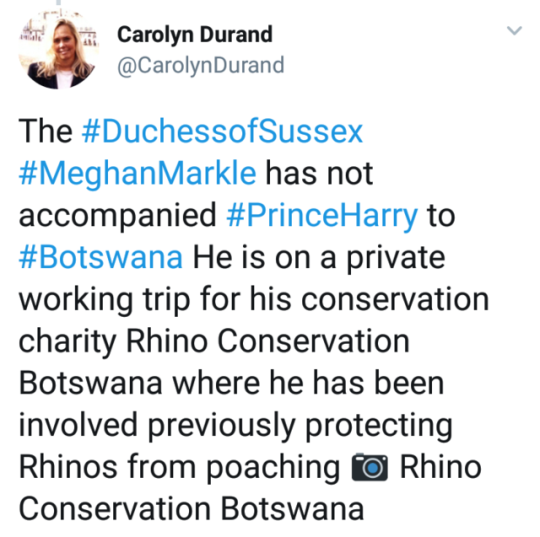 Harry travelled to the African country without wife Meghan earlier this week to meet senior staff and workers from the organisation Rhino Conservation Botswana (RCB). Botswana is helping to safeguard the continent’s population of black and white rhino and the duke takes a keen interest in the RCB’s work as its UK patron. It is understood Harry attended a meeting with senior staff on Wednesday and later that day toured a project in a village. 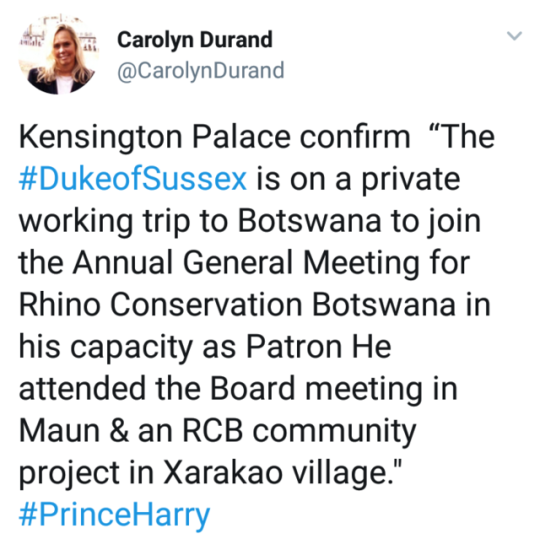 A Kensington Palace spokeswoman said: “The Duke of Sussex is on a private working trip to Botswana, to join the annual general meeting for Rhino Conservation Botswana in his capacity as patron. ‘More likely to seek solace in the arms of Chelsea Davey. The Duke of Sussex managed to take some time for himself after making a private trip earlier this week to Botswana. 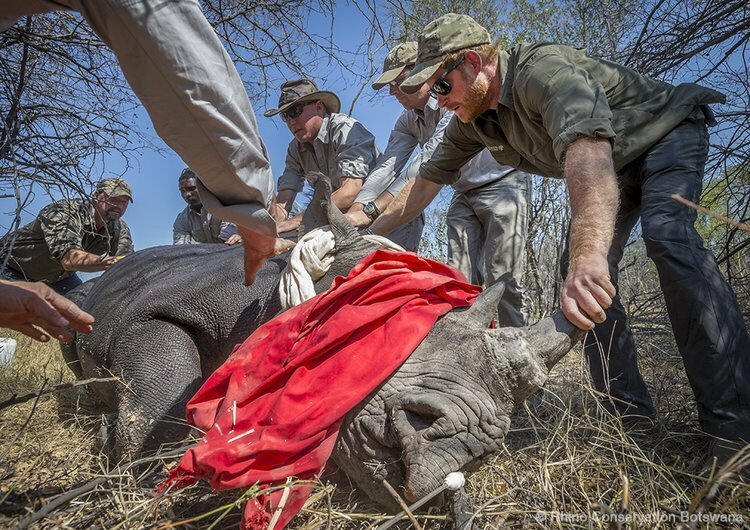 Prince Harry, who visited the country without his wife Meghan Markle, met with senior staff and members from the Rhino Conservation Botswana organisation. The Prince attended the annual meeting in Maun on Wednesday and then went on to see a RCB community project in Xarakao village. He is now believed to be back in the UK. He only went for a few days. The 33-year-old has always loved the African country, deciding to take his then-girlfriend Meghan in 2016 for their third date. 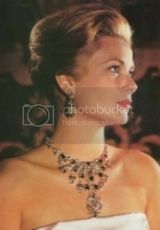 HerIG timeline has her in Europe at that time. The timeline of their meeting an "relationship" needs to be clarified still. I'm sure the immigration department has questions about it if she's sorting out her visa. The private trip follows a similar visit he made to the country in January when he carried out another fact-finding mission to learn about the charity’s latest developments. The royal couple are unlikely to be seen in public until September, as they take a break from the spotlight. Poor deer, how will she be able to merch and make money? So dimwit flown solo whats sparkle doing? Purchasing more expensive wardrobe outfits for humanitarian works whilst hitting the ground running! The Palace decided Harry should go alone as Harry thought the hysteria his trailer wife generates from her army of worldwide fans would detract from the purpose of his visit!! ^He's been going to Africa alone pretty regularly lately for short jaunts it seems to me. That's pretty expensive for a few days. Frankly, it makes me slightly suspicious. And not about another woman. I put this on another thread, but will post it here as well, re the above. True or false - who knows, but could well believe it. It makes me suspicious, too, Yooper. I’m getting the feeling he needs breaks from her. Are your reasons similar? Or don’t share if you’d prefer not. I just think something is going down. ^Maybe but he wouldn’t have to go to that extreme for just 48 hrs to get away from her. Feels like a drug run to me. And, no, I have no proof and this is only speculation but it’s the only thing that makes sense. He could’ve saved the taxpayers the flight and Skyped the meeting. He chose in person, solo and fast.